This article is about the novel. For the television series, see The ABC Murders (TV series). For the South African serial murders, see Moses Sithole. The A.B.C. Murders is a work of detective fiction by British writer Agatha Christie, featuring her characters Hercule Poirot, Arthur Hastings and Chief Inspector Japp, as they contend with a series of killings by a mysterious murderer known only as "A.B.C.". The book was first published in the UK by the Collins Crime Club on 6 January 1936, sold for seven shillings and sixpence (7/6) while a US edition, published by Dodd, Mead and Company on 14 February of the same year, was priced $2.00. The form of the novel is unusual, combining first-person narrative and third-person narrative. This approach was previously used by Agatha Christie in The Man in the Brown Suit. In The A.B.C. Murders the third-person narrative is supposedly reconstructed by the first-person narrator of the story, Arthur Hastings. The novel was well received in the UK and the US when it was published. One reviewer said it was "a baffler of the first water," while another remarked on Christie's ingenuity in the plot. A reviewer in 1990 said it was "a classic, still fresh story, beautifully worked out." Returning from South America, Arthur Hastings meets with his old friend, Hercule Poirot, at his new flat in London. Poirot shows him a mysterious letter he received, signed "A.B.C. ", that details a crime that is to be committed very soon, which he suspects will be a murder. Two more letters of the same nature soon arrive to his flat, each prior to a murder being carried out by A.B.C., and done in alphabetical order: Alice Ascher, killed in her tobacco shop in Andover; Elizabeth "Betty" Barnard, a flirty waitress killed on the beach at Bexhill; and Sir Carmichael Clarke, a wealthy man killed at his home in Churston. In each murder, an ABC railway guide is left beside the victim. The police team for the investigation, led by Chief Inspector Japp, includes Inspector Crome, who doubts Poirot's detective abilities, and Dr Thompson, who tries to profile the killer. Poirot forms a "Legion" of relatives of the deceased to uncover new information: Franklin Clarke, Carmichael's brother; Mary Drower, Ascher's niece; Donald Fraser, Betty's fiancé; Megan Barnard, Betty's elder sister, and Thora Grey, Carmichael's young assistant. Following a meeting with the third victim's widow, Lady Clarke, one key fact between the murders is discovered – on the day of each murder, a man selling silk stockings had appeared at or near to each crime scene. Despite this information, Poirot has doubts concerning why the letters were sent to him, and not to the police or the newspapers, and why the third letter misspelled Poirot's address, causing delayed receipt of it. Soon, A.B.C. sends his next letter, directing everybody to Doncaster, where it is suspected that the next murder will occur at the St. Leger horse race that day. However, the murderer strikes at a cinema instead, in which the victim's name does not match the pattern of the other killings. The police soon get a tip-off to the man linked to the murders – Alexander Bonaparte Cust, an epileptic travelling salesman who suffers from memory blackouts and constant agonising headaches as the result of a head injury during the First World War. Cust flees his apartment, but collapses upon arriving at the Andover police station, where he is taken into custody. Apart from claiming that a stocking firm hired him, he lacks any memory of committing the murders, but believes he must be guilty of them; he had been at the cinema when the last murder occurred, and found blood on his sleeve and a knife in his pocket after he had left. The police learn that the firm in question never hired Cust. Their search of his room turns up an unopened box of ABC railway guides, and the typewriter and fine paper used in A.B.C. 's letters, while the knife is discovered in the hallway outside his room where he dropped it. Poirot doubts Cust's guilt because of his memory blackouts, especially as he had a solid alibi for the Bexhill murder. Calling a Legion meeting, Poirot exposes one of its members, Franklin Clarke, as the A.B.C. murderer. His motive was simple – Lady Clarke is slowly dying from cancer, and upon her death, Carmichael would probably marry his assistant. Franklin feared a possible second marriage, as he wants all of his brother's wealth, thus he chose to murder his brother while Lady Clarke was still alive. A chance encounter with Cust at a pub gave Franklin the idea for the murder plot – he would disguise his crime under the illusion of a serial killing. Having created the letters Poirot would receive, Franklin set up Cust with his job, giving him the typewriter and other items he would use to frame him for the murders. A suggestion by Hastings makes clear that the third letter was misaddressed intentionally, as Franklin wanted no chance of the police interrupting that murder. Franklin then followed Cust to the cinema, committed the last murder, and planted the knife on him as he left. Franklin laughs off Poirot's theory, but panics when he is told that his fingerprint was found on Cust's typewriter key, and that Milly Higley, a co-worker of Betty, had seen him in her company. Franklin attempts to commit suicide with his own gun, only to find that Poirot had emptied it with the help of a pickpocket, allowing the police to apprehend him. With the case solved, Poirot pairs off Donald with Megan. Later, Cust tells Poirot that the press have made him an offer for his story; Poirot suggests that he demand a higher price for it, and that his headaches may have arisen from his spectacles. Once alone, Poirot tells Hastings that the fingerprint on the typewriter was a bluff, but is pleased that the pair "went hunting once more". Hercule Poirot – Renowned Belgian detective, involved in investigating the serial killings by A.B.C., due to letters received from him. Captain Arthur Hastings – Poirot's old friend and companion on the case. He is also the narrator of the novel. Detective Chief Inspector James Harold Japp – Poirot's old friend in Scotland Yard, and the chief investigating officer into the serial killings. Inspector Crome – Part of Japp's police team investigating the murders. Initially in charge of the Bexhill murder, and maintains a low opinion of Poirot. Dr Thompson – Forensic psychologist, assigned to Japp's police team. Focuses on making a profile of the killer. A.B.C. – The unknown, cold-blooded serial killer of the case. His pattern of murders is done in alphabetical order, with his calling card being an ABC railway guide left at each crime scene. Alice Ascher – A.B.C. 's first victim. An elderly woman with no children, and the owner of a tobacco shop in Andover. Betty Barnard – A.B.C. 's second victim. A young, flirtatious part-time waitress in Bexhill. Sir Carmichael Clarke – A.B.C. 's third victim. A rich, childless old man from Churston. George Earlsfield – A.B.C. 's fourth victim. A barber by trade, killed at a cinema in Doncaster. Considered illogical to be a victim in the pattern of A.B.C. 's murders. Franklin Clarke – The killer of the case. Sir Carmichael's aggrieved younger brother and his immediate successor. A member of the Legion assisting Poirot in the investigation, responsible for inspiring Poirot to form the group. Mary Drower – Ascher's niece. A member of the Legion assisting Poirot in the investigation. Megan Barnard – Betty's elder, sensible and comparatively down to earth sister. A member of the Legion assisting Poirot in the investigation. Donald Fraser – Betty's would-be fiancé, and a temperamental man. Initially a suspect in her murder, he later becomes a member in the Legion. Thora Grey – Sir Carmichael Clarke's attractive young assistant. A member of the Legion assisting Poirot in the investigation. Alexander Bonaparte Cust – An epileptic travelling salesman; his condition is the result of a blow to the head during the war, leaving him prone to blackouts and severe headaches. The prime suspect of the case, unknowingly setup by A.B.C. Franz Ascher – Alice's alcoholic and estranged husband. The initial suspect in his wife's murder. Milly Higley – A co-worker of Betty. Lady Charlotte Clarke – Sir Carmichael's wife, suffering from terminal cancer. Rendered delusional and/or irritated by the medication she takes. Roger Downes – School teacher visiting the cinema in Doncaster, and comes across Earlsfield's body after his murder. Lily Marbury – Daughter of Cust's landlady, who warns him about the police coming after him. Tom Hartigan – Boyfriend of Lily, who tips-off police to his suspicions about Cust's movements on the day of Earlsfield's murder. The Times Literary Supplement on 11 January 1936 concluded with a note of admiration for the plot that, "If Mrs Christie ever deserts fiction for crime, she will be very dangerous: no one but Poirot will catch her." Isaac Anderson in The New York Times Book Review of 16 February 1936 finished his review by writing, "This story is a baffler of the first water, written in Agatha Christie's best manner. It seems to us the very best thing she has done, not even excepting Roger Ackroyd." In The Observer's issue of 5 January 1936, "Torquemada" (Edward Powys Mathers) wrote, "Ingenuity ... is a mild term for Mrs Christie's gift. In The A.B.C. Murders, rightly chosen by the [crime] club as its book of the month, she has quite altered her method of attack upon the reader, and yet the truth behind this fantastic series of killings is as fairly elusive as any previous truth which Poirot has had to capture for us. The reader adopts two quite different mental attitudes as he reads. At first, and for a great many pages, he is asking himself: "Is Agatha Christie going to let me down? Does she think she can give us this kind of tale as a detective story and get away with it?" Then the conviction comes to him that he has been wronging the authoress, and that he alone is beginning to see through her artifice. In the last chapter he finds, because brilliant circus work with a troop of red horses and one dark herring has diverted his attention from a calm consideration of motive, he has not been wronging, but merely wrong. It is noticeable, by the way, that characters break off at intervals to tell us that we have to do with "a homicidal murderer". We are ready to take this for granted until Mrs Christie (I wouldn't put it past her) gives us one who isn't." E R Punshon reviewed the novel in 1936, writing that "Some readers are drawn to the detective novel by the sheer interest of watching and perhaps anticipating the logical development of a given theme, others take their pleasure in following the swift succession of events in an exciting story, and yet others find themselves chiefly interested in the psychological reactions caused by crime impinging upon the routine of ordinary life. Skilful and happy is that author who can weave into a unity this triple thread. In Mrs Agatha Christie's new book...the task is attempted with success." He added, "In the second chapter, Mrs Christie shows us what seems to be the maniac himself. But the wise reader, remembering other tales of Mrs Christie's, will murmur to himself 'I trust her not; odds on she is fooling me,' and so will continue to a climax it is not 'odds on' but a dead cert he will not have guessed. To an easy and attractive style and an adequate if not very profound sense of character Mrs Christie adds an extreme and astonishing ingenuity, nor does it very greatly matter that it is quite impossible to accept the groundwork of her tale or to suppose that any stalking-horse would behave so invariably so exactly as required. As at Bexhill, a hitch would always occur. In the smooth and apparently effortless perfection with which she achieves her ends Mrs. Christie reminds one of Noël Coward; she might, indeed, in that respect be called the Noël Coward of the detective novel." An unnamed reviewer in the Daily Mirror of 16 January 1936 said, "I'm thanking heaven I've got a name that begins with a letter near the end of the alphabet! That's just in case some imitative soul uses this book as a text book for some nice little series of murders." They summed up, "It's Agatha Christie at her best." Robert Barnard reviewed this novel favorably, calling it "A classic, still fresh story, beautifully worked out." He noted that the plot "differs from the usual pattern in that we seem to be involved in a chase: the series of murders appears to be the work of a maniac. In fact the solution reasserts the classic pattern of a closed circle of suspects, with a logical, well-motivated murder plan. The English detective story cannot embrace the irrational, it seems." His final judgment on this novel is that it was "A total success – but thank God she didn't try taking it through to Z." In the "Binge!" article of Entertainment Weekly issue #1343–44 (26 December 2014 – 3 January 2015), the writers picked The A.B.C. Murders as an "EW favorite" on the list of the "Nine Great Christie Novels". In Chapter 1, Poirot alludes to a situation in the 1935 novel, Three Act Tragedy. In the same chapter, Poirot mentions his failed attempt at retirement to grow vegetable marrows as depicted in The Murder of Roger Ackroyd. In Chapter 3, an exchange between Japp and Poirot shows that, in 1935, Christie was already thinking about Poirot's death as later narrated in Curtain: "I shouldn't wonder if you ended by detecting your own death," said Japp, laughing heartily. "That's an idea, that is. Ought to be put in a book." "It will be Hastings who will have to do that," said Poirot, twinkling at me. "Ha ha! That would be a joke, that would," laughed Japp. Still in Chapter 3, Poirot lays out the plot of what he considers a perfect crime, a crime so challenging that "even he" would find it hard to solve. This exact murder – where someone is murdered by one of four people playing bridge in the same room with him – is the subject of Christie's Cards on the Table, which was published later in the same year. In Chapter 19, Poirot reflects over his first case in England, where he "brought together two people who loved one another by the simple method of having one of them arrested for murder." This is a reference to the novel The Mysterious Affair at Styles, and the lovers mentioned are John and Mary Cavendish. The plot of The A.B.C. Murders is mentioned by Detective Inspector John Appleby in Michael Innes′ novel Appleby's End (1945). Chapters 393–397 of Gosho Aoyama's manga Detective Conan feature a case with some similarities as the criminal was inspired by the plot of The A.B.C. Murders. Episodes 325-327 of its anime adaptation also featured the incident. The 1998 anime film Case Closed: The Fourteenth Target is a combination of this story, with a murderer killing based on numbers in names as a ruse to confuse detectives, while also incorporating Christie's And Then There Were None. A Bengali detective novel of Narayan Sanyal 'O Aa Ka Khuner Kanta' was based on The A.B.C. Murders. Sanyal admitted the inspiration from Christie's novel in the introduction to the book. Here the character P. K. Basu, Bar-at-law, has the role of main protagonist, similar to Poirot. The first adaptation of the novel was the 1965 film The Alphabet Murders with Tony Randall as Hercule Poirot, a version far more comic than mysterious. The story of the 2012 Malayalam film Grandmaster draws inspirations from The A.B.C. Murders. The characterisation of Chandrasekhar in the movie as played by the Indian movie veteran Mohanlal is also inspired from Hercule Poirot, the protagonist of the novel. The BBC Radio adaptation Poirot – The ABC Murders starring John Moffatt and Simon Williams. First broadcast on BBC Radio 7 Saturday 22 March 2008. The show is periodically rebroadcast on BBC Radio 4 Extra. In 1992, the novel was adapted for television as part of ITV's Agatha Christie's Poirot, and was first aired in the UK on 5 January 1992. It starred David Suchet as Hercule Poirot, Hugh Fraser as Captain Hastings, and Philip Jackson as Chief Inspector Japp, with its guest stars including Donald Sumpter as Alexander Bonaparte Cust, Donald Douglas as Franklin Clarke, Nicholas Farrell as Donald Fraser, and Pippa Guard as Megan Barnard. The characters of Inspector Crome, Dr Thompson, Lily Marbury and Tom Hartigan are omitted. Police are alerted to Cust's suspected involvement with the murders through his landlady, while the knife used in the fourth murder is found in his room. Franklin Clarke attempts to escape when he is exposed by Poirot as the killer. In 2018, an adaptation of the novel, written by Sarah Phelps, was filmed for the BBC. It was aired as a three-part miniseries over three consecutive days from 26 December that year. It starred John Malkovich as Hercule Poirot, and Rupert Grint as Inspector Crome with guest stars including Eamon Farren as Alexander Bonaparte Cust, Jack Farthing as Donald Fraser, Freya Mavor as Thora Grey, Kevin McNally as Inspector Japp, and Anya Chalotra as Lily Marbury. Captain Hastings is omitted from the plot. Japp dies from a heart attack at the start, leaving the investigation to be solely conducted by Inspector Crome. Poirot's background is explored prior to the outbreak of the First World War; in this adaptation, he was a priest before the war rather than a detective in the Belgian police force. The first three murders are committed in locations that have some relevance to Poirot; he helped deliver a baby when on a refugee train that stopped in Andover, visited the café where Betty Barnard would later work on a visit to Bexhill, and attended a party at the Clarke house. More care is taken in planning the D murder; rather than just stabbing someone in a cinema reasoning that someone with a suitable name would be nearby, the killer attempted to kill a comedian about to put on a show, only to kill his performing partner. A fifth murder is conducted pertaining to the letter E and Cust is present at the scene. The killer is surprised by this and takes this opportunity to implicate Cust by planting the weapon when Cust has a fit. Cust is pursued by police shortly after murder E. He is caught after he injures himself, rather than passing out at a police station. There is no reference to Mary Drower, Alice Asher's niece, within the plot. Thora Grey's character is changed to being manipulated into being Franklin's accomplice by establishing an alibi for him in one of the murders. Franklin claims, prior to his execution, that he committed the crimes to give Poirot a new cause to live for, considering them friends, although Poirot has nothing but disdain for the man's methods. A four-part episode of the anime Agatha Christie's Great Detectives: Poirot and Marple is based on the book. The A.B.C. Murders are also an arc of the anime "Hyouka", or episode 15 "The Jūmonji Case" of Hyōka video series. 'ABC Satsujin Jiken' (ABC殺人事件, The ABC Murders) is a two volume manga by Yasushi Hoshino loosely based on a mixture of the original novel and Murder in the Mews. Set in Japan, Poirot retains his iconic appearance though is renamed Eikubo while Hastings is renamed Asakura. In 2009, DreamCatcher Interactive released a video game version of the novel for the Nintendo DS entitled Agatha Christie: The ABC Murders. The game has players control Captain Hastings and must solve the mystery by inspecting crime scenes and questioning suspects. To appeal to players familiar with the original story, the game also offers the option to play with a different murderer, which results in different clues and testimony throughout the entire game. The game received mediocre reviews, but was commended for its faithful recreation of the source material. The first true publication of The A.B.C. Murders occurred in the US with an abridged version appearing in the November 1935 (Volume XCIX, Number 5) issue of Cosmopolitan magazine with illustrations by Frederic Mizen. The UK serialisation was in sixteen parts in the Daily Express from Monday 28 November to Thursday 12 December 1935. All the instalments carried an illustration by Steven Spurrier. This version did not contain any chapter divisions and totally omitted the foreword as well as chapters twenty-six, thirty-two and thirty-five. In addition most of chapters seven and twenty were missing. Combined with other abridgements, this serialisation omitted almost 40% of the text of the published novel. ^ "The Classic Years: 1935 – 1939". American Tribute to Agatha Christie. May 2007. Retrieved 28 April 2014. ^ a b Anderson, Isaac (16 February 1936). "Review". Book Review. The New York Times. p. 25. ^ a b Torquemada (5 January 1936). "Review". The Observer. p. 6. ^ a b Barnard, Robert (1990). A Talent to Deceive – an appreciation of Agatha Christie (Revised ed.). Fontana Books. p. 187. ISBN 0-00-637474-3. ^ Punshon, E R (6 February 1936). "Review". The Guardian. p. 7. ^ Innes, Michael (1945). Appleby's End. Gateshead: Northumberland Press Limited. pp. 126–28. ISBN 0-575-01540-3. ^ Aoyama, Gosho (2002). Detective Conan. 39. Shogakukan. ISBN 4-09-126169-8. ^ Sanyal, Narayan (1994). O, Aa, Ko Khuner Kanta (Bengali). Kolkata: Dey's Publishing. p. 7. ISBN 81-7079-305-X. ^ "Buy Poirot – The ABC Murders". BBC. Archived from the original on 3 January 2016. Retrieved 4 October 2015. ^ "Poirot – The ABC Murders". BBC Radio4 Air Dates. Retrieved 10 August 2013. ^ "The ABC Murders episode 1". BBC Programmes. Retrieved 7 January 2019. ^ "All-star cast announced for new BBC One Agatha Christie thriller The ABC Murders". BBC Media Centre. 24 May 2018. Retrieved 17 December 2018. ^ "First-look image of John Malkovich as Hercule Poirot in BBC One's The ABC Murders". BBC Media Centre. 21 June 2018. Retrieved 21 June 2018. ^ "The ABC Murders Begins on BBC One on Boxing Day at 9pm". BBC Media Centre. 15 December 2018. Retrieved 20 December 2018. ^ a b Wilson, Will. 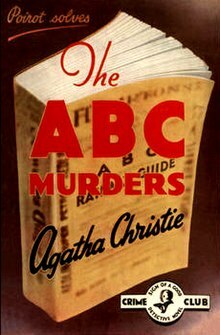 "Agatha Christie: The ABC Murders". Pocket Gamer. Retrieved 19 October 2010. ^ Newton, James (25 November 2009). "Agatha Christie's 'The ABC Murders' DS Review". nintendolife.com. Retrieved 6 December 2013. ^ Holdings at the British Library (Newspapers – Colindale). Shelfmark: NPL LON LD3 and NPL LON MLD3.